One of the most important aspects of any search application is the ability to show relevant content that satisfies the needs of your users. Measuring relevance requires combining search results with the app side user interactions, and it can be hard to decide what to collect and how to do it. This is why we are excited to announce our new version of Search Traffic Analytics, a pattern on how to structure, instrument, and monitor search queries and clicks, that will provide you with actionable insights about your search application. You’ll be able to answer common questions, like most clicked documents or most common queries that do not result in clicks, as well as provide evidence for other situations, like deciding on the effectiveness of a new UI layout or tweaks on the search index. Overall, this new tool will provide valuable insights that will let you make more informed decisions. Let’s expand on the scoring profile example. Let’s say you have a movies site and you think your users usually look for the newest releases, so you add a scoring profile with a freshness function to boost the most recent movies. How can you tell this scoring profile is helping your users find the correct movies? You will need information on what your users are searching for, the content that is being displayed and the content that your users select. When you have the data on what your users are clicking, you can create metrics to measure effectiveness and relevance. To obtain rich search quality metrics, it’s not enough to log the search requests; it’s also necessary to log data on what users are choosing as the relevant documents. This means that you need to add telemetry to your search application that logs what a user searches for and what a user selects. This is the only way you can have information on what users are really interested on and wether they are finding what they are looking for. There are many telemetry solutions available and we didn't invent yet another one. We decided to partner with Application Insights, a mature and robust telemetry solution, available for multiple platforms. 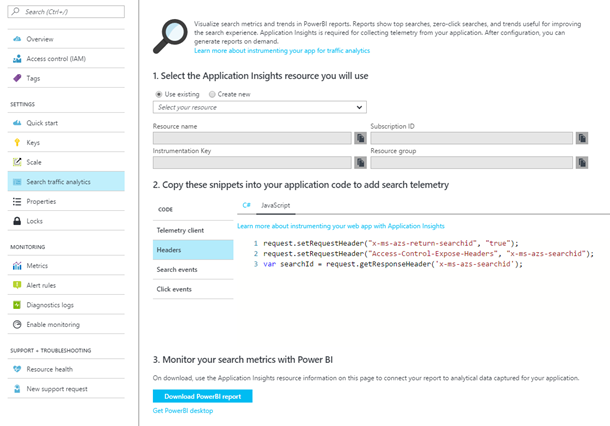 You can use any telemetry solution to follow the pattern that we describe, but using Application Insights lets you take advantage of the Power BI template created by Azure Search. Because it’s not easy to decide what to log and how to use that information to produce interesting metrics, we created a clear set schema to follow, that will immediately produce commonly asked for charts and tables out of the box on Power BI desktop. Starting today, you can access the easy to follow instructions on the Azure Portal and the official documentation. • Clickthrough Rate (CTR): ratio of users who click on a document to the number of total searches. • Searches without clicks: terms for top queries that register no clicks. • Most clicked documents: most clicked documents by ID in the last 24 hours, 7 days and 30 days. • Popular term-document pairs: terms that result in the same document clicked, ordered by clicks. • Time to click: clicks bucketed by time since the search query. Monitoring metrics and logs are still available. You can enable and manage them in the Azure Portal under the Monitoring section. Enable Monitoring to copy operation logs and/or metrics to a storage account of your choosing. This option lets you integrate with the Power BI content pack for Azure Search as well as your own custom integrations. 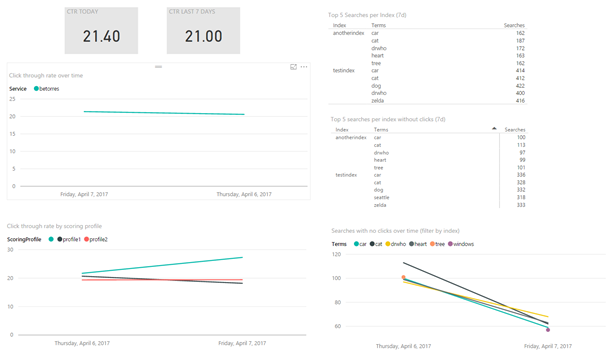 If you are only interested in Metrics, you don’t need to enable monitoring as metrics are available for all search services since the launch of Azure Monitor, a platform service that lets you monitor all your resources in one place. Follow the instructions in the portal or in the documentation to instrument your app and start getting detailed and insightful search metrics. You can find more information on Application Insights here. Please visit Application Insights pricing page to learn more about their different service tiers.